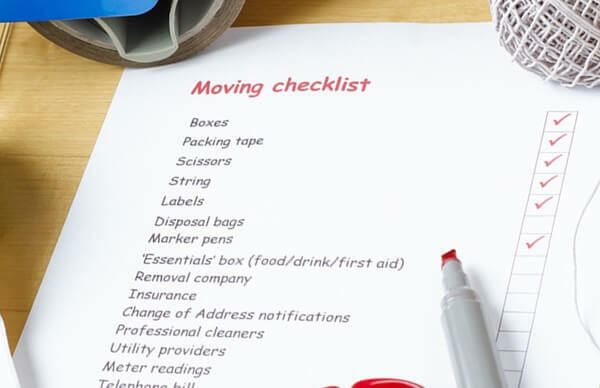 This handy household moving checklist can make things a little easier if you find yourself having to move after your divorce. Whether you're moving across town or across the county, you can save a lot of time, hassle, and expense if you are able to plan your move ahead of time. It's amazing just how many boxes it takes to move a household. The major movers and truck rental companies have a ready supply of high grade boxes and packing materials. If you have the money, this is the easiest way get boxes and everything you'll need. If your budget won't quite stretch far enough to buy all your packing materials, you can usually get boxes from your local grocery, liquor, and convenience stores. Since many stores break down their boxes right away, be sure to go in ahead of time to let them know that you need boxes. Many times, the clerks will set them aside for you. Another idea is to check around apartment dumpsters at the beginning of the month for boxes people throw away after they've moved in. It's also a good idea to have several rolls of heavy-duty strapping or packing tape to seal up your boxes. You'll also need bubble wrap or packing paper to cushion breakables. A good resource for packing paper is your local newspaper. Just ask for unprinted end-rolls. Be sure to have a couple of permanent markers to label the boxes and a notepad to keep track of the contents of each box. Having a moving company is great if you can afford it or if your company will pay for it as part of you relocating to a new area for your job. Be sure to shop around for the best rates and availability of times before you make your final decision on moving companies. If using a professional moving company is out of the question, you can still rent a moving truck or trailer. Some of the main rental companies include U-Haul, Budget, Hertz, and Ryder. Before deciding on which company to rent from, get an estimate of what size truck you'll need to move your household (most companies can help you determine this). You'll also need to find out how much they charge for mileage on top of the base rental rate. Ask if they offer any special discounts and how far in advance you can reserve the rental. There is also a hybrid option available from U-Pack Moving. Basically, they deliver a moving trailer or container to your home for you to pack your belongings in. After everything is loaded, you call the company for pickup and they will deliver it to your new location for you to unpack. First you want to set a moving date so you can make sure your friends will be available to help you and you'll be able to get the reservation for the moving truck. Then, it's a really good idea to start packing non-essential items and getting rid of the stuff you don't want to take to your new home. This can actually take a while, so be sure to spread it out over time instead of trying to cram it all into one day. If you pack as much stuff beforehand as possible, it will save a lot of time and hassle on moving day. When packing your things in boxes, it helps to number the box on two sides and what room (or cabinet) it belongs in. Then write everything that is in that box on a master household moving checklist that details the contents of each box. This will save needless hours of searching through boxes looking for something specific after you move. You'll want to keep essential items handy to use during the move and for after you move into your new home, so don't pack those up until you're ready to walk out the door. Start cleaning your house as much as possible to save time during moving day. Do the windows, oven, garage, and anything else that will take a while to clean. Get the yard in shape and empty the gas from your lawn mower and weed eater. Utilities - Be sure to set a disconnect date for at least a day after you move out and notify them of your new address so they can send you the final bill and any deposit refund you might have coming. You'll also want to make sure the utilities will be turned on at your new house when you arrive, so be sure to make these arrangements early. Mail forwarding - Put in a mail-forwarding request with the post office to ensure your mail will be delivered to your new house. It's also beneficial to notify businesses before-hand about your move. Be sure to get copies of your existing records (transcripts from schools, medical and dental records, veterinary records, etc.) when you're notifying the following businesses about your new address. Before the actual moving day, call your friends to verify they will still be able to help with the move. It's always best to start early in the day so you'll have enough time to get everything done. Also, see if you can line up someone to babysit your kids on moving day. Nothing slows down the process faster than hunger or cranky kids. It's a really good idea to have a hand-truck or dolly to help move the heavy stuff and all your boxes. Most of the truck rental companies have hand-trucks they rent out, and it's definitely worth the expense. It's a good idea to have lots of water and drinks on hand to help quench everyone's thirst. And be sure that you have toilet paper in the bathroom and paper towels in the kitchen. Tools such as a hammer, screw drivers, pliers, tape measurer, flashlight, etc. Important documents such as birth certificates, school records, financial documents, social security cards, deeds, car titles, medical records, etc. Computer and electronics as well as their chargers. Also, be sure to keep the following cleaning supplies handy so you can get your old home or apartment ready for the move out inspection. While you're getting everything packed in the moving truck or trailer, don't forget to take breaks and stop for lunch. This is one time when pizza delivery or going to the drive-through is a good idea. After everything is moved out, clean up the house, throw out the trash, and double-check to make sure you've left nothing behind (don't forget to look in the attic). Finally, turn off the lights, turn down the heater, and lock the windows and doors before you leave for good.